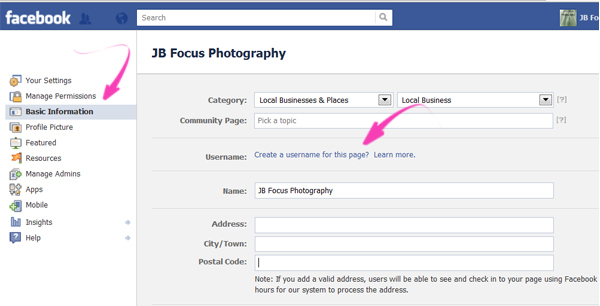 When you set up a new Facebook Business page, the default URL (web address) for the page is something like http://www.facebook.com/pages/JB-Focus-Photography/152681298122046. Not exactly user friendly, they are long and awkward for inclusion in printed marketing materials, and impossible for customers to remember. Facebook does allow you to create a “custom” URL for your page – like www.facebook.com/RoseMcGrory – but until a few days ago, anyone setting up a new Facebook Business page would have to wait until they had at least 25 “Likers” before Facebook allowed them to set that unique name and address for their Page. That’s now changed, so that you can set a custom URL straight away (and look out for a LOT more over the next few weeks – there’s a big conference for Facebook developers tomorrow, where we’re expecting many new developments to be unveiled). Here’s how to do it, and some of the things to consider when you do. 1. Click the Edit Page button on the top right of the screen. 3. Click “Create a username for this page” (indicated below). 4. You’ll then be given a box into which you can type your choice of username – the bit you’re adding is what will come after the “www.facebook.com/” so in our case, it’s just “RoseMcGrory”. Use the check availability button – if you have a business name with commonly used words in it, you may find that someone else has already claimed that address and you’ll need to have a rethink. Once you get the popup confirming that your latest choice is available – DO NOT hit “confirm” until you’re absolutely sure that’s the name you want. Previously, you could amend the username until your page had a certain number of Likers, now you are stuck with it for ever! If you have a very long business name, a shorter form will be less cumbersome for customers to use; and don’t be tempted to stuff the URL with keywords at the expense of useability! “marketinganddesigninLeicester” might cover all the bases, but isn’t going to be easy for your users! Again, if there are keywords you’d like to use but which are prone to mis-spelling – a problem we have all the time with the “McGrory” part of ours – you might consider going for an alternative naming route. This cuts down on the chances of a customer putting a typo in, getting a “page not found” message, and giving up. The classic issue here is with the use of underscores, hyphens, and other punctuation marks. www.facebook.com/brilliant_marketing_ltd is great on the page, but as soon as you have to pass it on in a spoken format, there’ll be trouble – many people don’t know the difference between an underscore and a hyphen, and you’ll have to go to great descriptive lengths to make sure they get it right. We’ve heard conflicting opinions about whether including the keywords your business targets for search purposes, for example “social media training UK” for us, has any benefit from an SEO point of view (any SEO gurus reading, please feel free to comment!). If you’re going to do this, do consider both useability and also consistency; while you can use a long URL on Facebook, you couldn’t keep that username consistent on Twitter, for example, because of the length restriction. One final point – it seems that, at least for now, you may only be able to get an immediate custom URL for one page. If you manage many pages with few likes, choose carefully which one to change first. This may just be a way for Facebook to prevent an avalanche of URLs being registered and may change soon, but if it doesn’t, anyone needing multiple new-page custom URLs will need to talk nicely to their friends who haven’t yet used up their Admin allowance! Regarding whether keywords in Facebook Page names are helpful I would say a resounding “Yes”. It’s especially useful if your company name, website URL and Facebook Page ALL have your keywords in them. For example, we wanted to focus on the key phrase ‘flatpack assembly suffolk’ for a new client and so named the Facebook Page http://www.facebook.com/FlatpackAssemblySuffolk as soon as we could. The website URL uses the same phrase and their Twitter account is a shorter version, @FlatpackSuffolk, while the company name is simply that key phrase as well. So EVERY reference to the business uses the number one key phrase. That makes it less certain exactly what Google is picking up on, but their website and the Facebook Page (and a blogger blog) appear on page one for that key phrase, at least locally, as you would expect. That’s interesting Roy -and it certainly helps if your company name and target keywords are one and the same, as you say! I disagree with Roy’s approach of stuffing keywords into everything you create online. Your brand is a long-term asset that should be developed and nurtured over time, not kicked into the long grass for some perceived short-term SEO benefit. Over time brands evolve and diversify – the company focused on “flat pack assembly” today, will almost certainly want to move into new products & services in the future. But they are stuck with the keyword-stuffed website domain, facebook page, twitter account etc. that is no longer relevant to the brand. There are hundreds of factors affecting search rankings – your domain name is just one. Don’t get fooled into thinking you must ditch your brand for SEO benefit. It’s very easy to rank #1 in Google for a term nobody ever searches for. But ranking for competitive keywords is going to take more than a keyword stuffed domain name. Facebook is a place to showcase you brand and to engage with your audience – to share and to listen. So where Facebook is concerned concentrate on doing this – not worrying about SEO. Hi Blaine. We thought that engagement should always be the overriding consideration on Facebook (and of course if your Page name isn’t user friendly, folks may never find it, let alone engage!). But then we would say that, as it’s our main area of work. Good to know that any SEO benefits are likely to be too minimal to be worth endangering that – thanks!